The latest 2.2kVA model from Kipor - the IG2000i. This inverter generator is ideal for camping, providing the right amount of power for comfort applications without being big and heavy to transport. It's also light on your pocket, making it the best generator for an occasional camper. 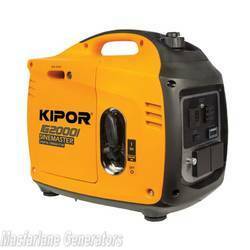 Inverter technology allows the generator to power sensitive equipment like laptops and phones. It's also perfect for small jobs around the home, or for powering other portable applications such as music systems. All Kipor Digital Inverter Generators feature high efficiency, petrol air cooled engines which produce extremely low emissions.